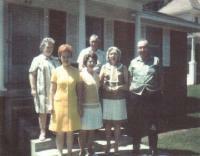 Arnott and Vederoff Ancestors - Senatobia, Mississippi, June 3, 1970. Photo probably taken by Alice Joyce Stevens Arnott. In back are Sally and Milton Wheeler. In front from left, Grace McCrary, Bess Fulton, Eudora Stevens Prasifka, and Thomas Arnott. Senatobia, Mississippi, June 3, 1970. Photo probably taken by Alice Joyce Stevens Arnott. In back are Sally and Milton Wheeler. In front from left, Grace McCrary, Bess Fulton, Eudora Stevens Prasifka, and Thomas Arnott.